I used the small Union Jack panel from the Riley Blake Designs collection. There are so many fun colors to choose from. You might need to do what I did and make several of your favorite colors. 2. Quilt desired pattern on the Union Jack through all layers. Trim around the outside edge, leaving a ¼” seam allowance. 3. Cut 2 sections 1 ¼”. 4. With right sides together place zipper on top of the first 1 ¼” section. 5. Topstitch on right side of fabric. 8. 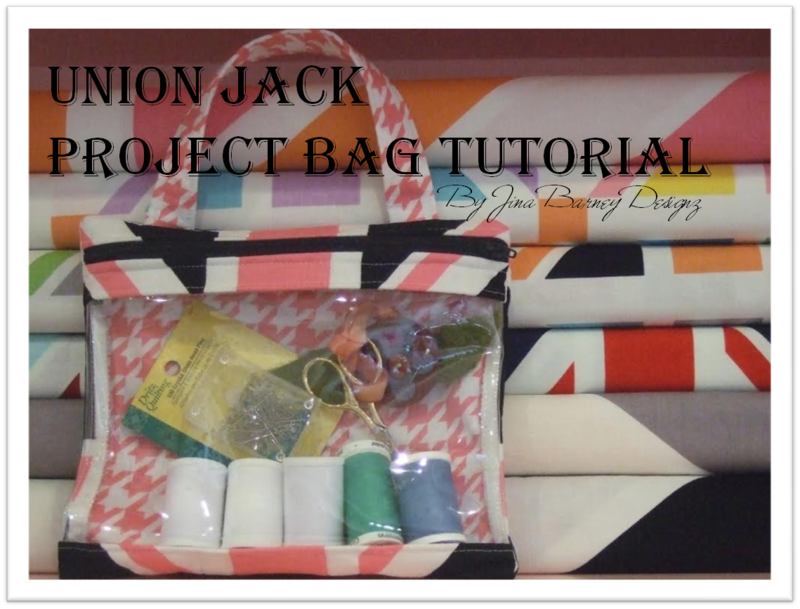 Sew plastic to the right side of the Union Jack. Finger press seam toward fabric not the plastic. Zig zag edge. Topstitch. 9.Sew plastic to the zipper side of the Union Jack. Finger press seam toward fabric not the plastic. Zig zag edge. 11. Press long handle edges into the center. Press in half again. 12. Topstitch along both folded edges. 13. Pin handle in place. Note: about 2” in from each side. 15. Sew and zig zag side seams. slow down so you don’t break a needle. 16. Turn right side out. Push all four corners out. Have fun making many more Project Bags. They are so quick and easy to make. These are so simple you will want to make one for each of your friends. They are wonderful gifts and a great way to store all your on the go projects! They are very cute. I need to make a couple of those. Love your project bags! I had purchased some vinyl last year and haven't used it yet...this would be a perfect project! I am so glad i persisted to find you, the link provided was somewhere else...i will change it to here.....no doubt about it, you have the most amazing ideas and this one zippers in to be one of your finest tuts. I haven't seen these panels in the UK yet but I shall keep looking! Fabulous! Now I just need to figure out where to find some clear vinyl in town... Will you be making a youtube tutorial for this project bag? I love watching RBD tutorials, you ladies take the time to explain things thoroughly and I really appreciate that. Thank you for sharing! These are so cute and useful too! Thanks for the tutorial. Such neat project bags! Thank you for the easy to follow tutorial. Oh my gosh! Those are just too cute. Great tutorial! Thank you. Thank you for the tutorial! They are so cute - I am going to make some for my sisters for Easter! Very cute idea. Great way to use that panel. These are so cute!!! I totally want to make one. Great tutorial. I love it and I can't wait to sew one!!! Thanks for the tutorial!!! Thanks for the tutorial. So easy. Sweet! I made a project bag like this a couple of weeks ago. Well, not like this - fabulous fabric! I especially love the houndstooth prints paired with the Union Jack!! Anyone is super dute.Thanks for the tuto! Darling little bag. Thanks for the directions! Just found this through Mdm Samm's "T'was the Night " blog hop. Great project tutorial. Thanks for sharing.